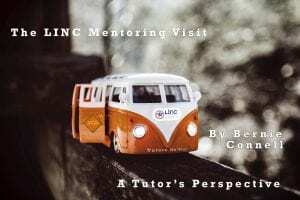 In this week’s blog, LINC tutor Bernie Connell describes how she approaches each mentoring visit, giving an example of a recent visit she made to Nadine’s service. How do I prepare to make my first mentoring visit of the year? Students can often look forward in anticipation to this aspect of the programme, however tutors have lots of preparatory work in advance of meeting students in their place of work. As a LINC tutor, I love to participate in the learning journey with my students; I love to hear the positive feedback and try to make the experience as meaningful and practical as I can. The mentoring visit lasts for an hour to an hour and a half, and is where I really get to know my students and bond with them in a way that is sometimes difficult in the face-to-face sessions. I endeavour to meet the students’ need in the best way that I can, by firstly identifying how inclusion is viewed within the setting and then tailoring the meeting to best suit each student’s needs. 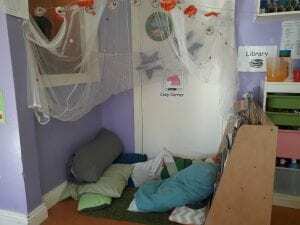 Whether the student is in the ECCE room, managing a small service, the owner, or a first time room leader, as a tutor I want this visit to be as useful and practical as possible. In advance of the visit the student must complete a mentor form. Once this is processed, an email is sent out to agree a time slot for the visit. The tutor will then prepare a folder which includes, google maps, information on the student’s position within the service, the tutor’s Garda clearance and a student handbook. The handbook is important as it includes the reflections for inclusion document on which both the mentoring visit and the portfolio are based. This year my first mentoring visit was with Nadine. She is an ECCE room assistant, so my focus is on the questions she has most difficulty with on her mentoring form as well as trying to guide her through the role of Inclusion Coordinator. What the role will mean for her in her service? How will she best disseminate the information? Will it be through the notice board, staff meetings etc, and how can she influence other rooms within the early learning and care (ELC) service? Would it be possible, or would she have time to share content she has learned in LINC with other teachers in the service? How can she best support all children, colleagues and her manager to ensure the best possible outcome from the LINC programme? Having completed this programme, Nadine will qualify as an Inclusion Coordinator and also a room leader (DCYA approved in August 2018) for her service. The purpose of this visit will be to cover any questions that arise as part of our reflections for inclusion document and also to help Nadine to understand her role as INCO. I love this part of my job. I am always slightly anxious and very eager for the visit to be as practical and meaningful as possible. As I set out on the visit, I am conscious of all the things that are beyond my control (such as M50 traffic!). My first visit this year is to a student who volunteered to be first on one of our evening tutorial sessions. Bernie Connell graduated with a first in Early Childhood Care and Education in 2015 from the Carlow Institute (H Dip Level 8). She has also completed a mentoring and leadership programme in conjunction with Early Childhood Ireland and South Dublin Childcare Committee. In her role managing a busy community childcare centre for seven years, she oversaw the centre’s involvement with two key research projects, both the NEYAI (National Early Years Access Initiative) and CDI (the Childhood Development Initiative project based in Tallaght West). Bernie has worked as a tutor with Kildare Wicklow ETB for the past 10 years. Bernie also has a BA (hons) in languages Spanish and French, an accounting technician qualification and has worked in private industry for many years. A committed life-long learner Bernie believes in nurturing the seeds of education in children from the earliest stage possible. The LINC programme is opening for applications in March 2019 for more see www.lincprogramme.ie.